Every House Needs a Good Foundation to Be Built On. Consider This The Foundation of Your Best Pasta Recipes. This is the first year in a long long time we have not had a small space garden. My husband is the green thumb in our family and with all the family things going on, we just didn’t get one planted in time. It didn’t seem like a big deal. I was busy as well so not having to remember to water and look for pesky weeds was kind of a relief. BUT, now I am really missing the bounty of tomatoes he used to bring in by the basket full. I made countless tomato salads and salsa, but after seeing this recipe, I wish I could cook up a huge crock pot and can it for later! How tasty would that be! Fresh from the garden tomato taste in the middle of winter. 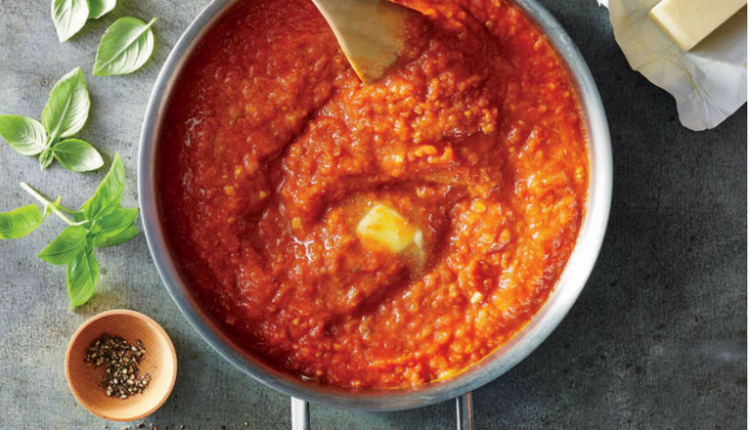 Well, even if you don’t have a garden you can head to a local farmers market and pick up a huge sack for this basic sauce. I love that this is a meatless version for all my vegetarian friend, but for us omnivores, I add in cooked Italian sausage! WOWZA! The Pasta sauce is the base for so many recipes and you can buy a jar of it, but I really like making my own. It is tastier, more budget friendly , and you know exactly what you have put in it. For moms who make their own babyfood or toddler food , this is great because you can adjust the spices and know your little one is eating something that is healthy for them. What my kids have to say about this recipe. Can you make this for my birthday dinner! GO TO NEXT PAGE FOR LIST OF INGREDIENTS AND DIRECTIONS. Quick Tip: Meat Lover? Go ahead and add in whatever sausage of beef you choose..or chicken sausage works as well. On Second Thought..Maybe I do Have Time For This!